In case you missed it, Lisa Damour wrote this article about what your kids – and likely your office mates, family members, and every neighbor on your block, too – are playing. This article is a couple of weeks old and, while Lisa’s parenting advice is timeless, the game details are already out of date. That's because, since its publication, the island has been hit by a meteor and there have been several new character skins and weapon enhancements added, not to mention jet packs! Just go ask your kids. The most common parenting question I get these days basically boils down to: what do you do about Fortnite in your house? And so here it is. We have Fortnite. My son – almost 13 – loves it and would play every day if I agreed. I don’t. He plays solo and on teams where he strategizes with friends, and has won at least once, hence his character’s umbrella that inflates as s/he drops down to the island at the start of each game. (Side note: who knew a virtual umbrella a-la Mary Poppins would be a coveted prize? Go figure.) My daughter also plays, though far less often and with significantly less craving. She’ll join a game, but easily walk away when the game is done if there’s something better (social media, cough, cough) beckoning her. I chalk it up to her age (she’s two years older), her temperament (she’s never been much of a gamer), and her preference for the relatively static images and content of Snapchat or Instagram. I am fascinated by many of Fortnite’s features, like the fact that your avatar may be male or female and that poses no issue. Score one for the egalitarians. I am also fascinated by the fact that so many people will spend real money to buy their make-believe characters new skins. In case you are wondering, “skins” are costumes. But apparently they are oh so much more. 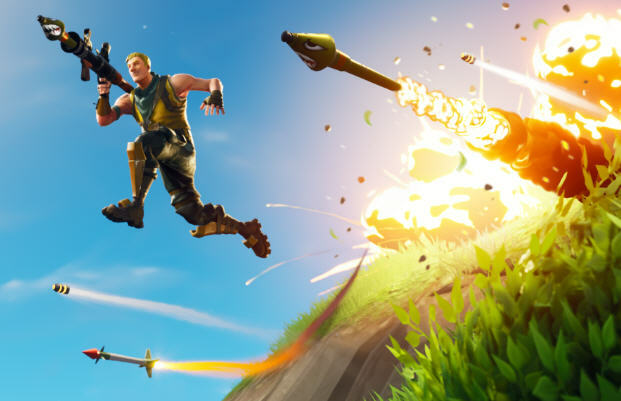 In March, Fortnite posted more than $200 million in revenue for the month, mostly thanks to skins and other accessories. That’s pretty big bucks for a game that’s free and first debuted less than a year ago. I still haven’t shared my rules, and maybe that’s because they are constantly evolving. For what it’s worth, here they are, at least right now. There’s no gaming during the school week, but I have been known to let that one slide. When the meteor hit and the island was rumored to be radically different, I let my kids on for a few minutes that Tuesday night to check it out. By the way, the island wasn’t that different – still the same old combination of lush open spaces and depressing, dilapidated city ruins, both of which you experience in solitude until someone gets close enough to try to off you. Back to the rule, Fortnite is pretty much off limits Sunday through Thursday nights. Friday afternoon/evening, Saturday, and Sunday daytime… there’s Fortnite but there’s a time limit. We agree on that limit before the first game starts because the negotiations at the end can be brutal. I have gone back to a preschool-style 5-minute warning before it’s time to get off, otherwise there’s a whole song and dance about how “I can’t leave the game and strand my teammates…” which, by the way, they can. But with enough warning, it works out pretty well. And I am slowly working my way towards making them responsible for getting off themselves at the appointed time. Baby steps. The actual amount of time: it varies. More than 45 minutes playing any game (including the game called social media) and my kids become a little snappy. They see it too – probably because I point it out – but that has set a natural time limit that they seem to be okay with. They actually don’t like how they feel when they are emerging from the screen haze. I will, though, occasionally let them go back and play more later in the day. The 45-minute rule isn’t absolute and after they’ve switched things up for a while by getting fresh air, exercising, hanging out with friends, or having a meal, they return to their baseline selves. So I don’t have an issue letting them play again later. But don’t go thinking I am good with several 45-minute gaming sessions scattered throughout the day, because I’m not. They might play once in the morning and once in the afternoon. And they know not to push their luck. The device varies, too, and this is important. Fortnite released a mobile version a few weeks ago, so now the game is accessible everywhere a cellphone or iPad or laptop can go. My kids generally play in one room of the house, and at the moment they prefer to plug the Xbox into a monitor because the mobile version can be “laggy” (oh, parents, you need to learn the lingo!). But I bring this up because you can think you are setting limits and being some sort of parenting genius when, all the while, your kids are just playing the same game on different devices. Teachers at school are not happy about this. Trust me. You think it’s bad at home? Try teaching a math class. And finally, there are external limits that can be set using various parental controls on a phone, computer, or even on the Xbox itself. I haven’t gone here yet, but I may. Right now, I follow their time using the Circle, which is a device I installed next to my router to keep track of how much time everyone in the house spends on any given app, site or device. It’s not perfect, but it’s good enough. And since my kids know we have it and they see the tallies, they aren’t tempted to try to sneak in lots of extra gaming on the sly. Got any tips that work in your house? Any insight that you want to share? Please post!